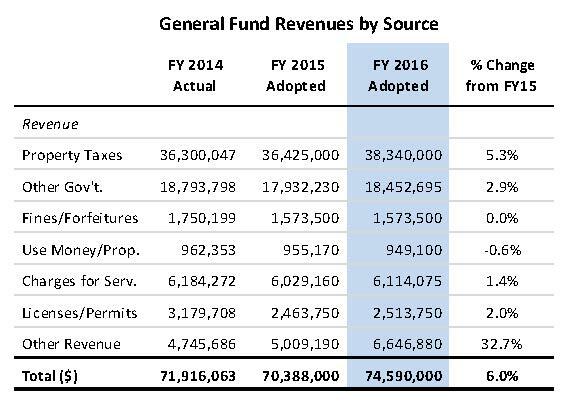 Property taxes not only represent the largest share of general fund revenues at $38 million but they are also expected to grow more than 5 percent in 2016 compared to last year. That’s not because of increased rates, but increased property values. Although I always grumble when I receive my property tax bill, I’m slightly mollified by knowing that the value of my house has also increased (and that I’m helping pay for those things I value in my community, such as roads, parks, police, libraries, schools, etc. etc.). In chatting with others in the community, they also grumble about property taxes but place most of the blame on the City of Rockville, but it should actually be aimed at Montgomery County. Look again at your property tax bill and note that the lion’s share goes to the County. Not only do they receive most of the taxes you pay on your property, but Montgomery County raised the rates for most of the past decade. That changed a couple years ago and is slowly decreasing (but that could change again–keep reading). Rockville, on the other hand, has kept rates flat for nearly a decade. If you’re unhappy with your property taxes, send most of your complaints to the County Council, not City Council. The chart below is based on data provided by the Maryland Department of Assessments and Taxation and does not include Rockville’s personal property tax rate nor the special property tax rate for Rockville Town Square. Many residents also are unaware that income tax is the second largest single source of revenue for Rockville’s general fund, which is estimated to provide $12 million this year, roughly the same as the last two years. This may decline slightly as the State of Maryland issues refunds and revises its tax credits for those who receive income from out-of-state to eliminate double taxation in accordance with the recent US Supreme Court decision of Maryland State Comptroller of Treasury vs Wynne (if you believe this affected you, you can file an amended return for 2012, 2013, and 2014). And according to County Executive Leggett, it may also mean that county property tax rates will rise to fill the hole left by reduced income tax revenue (sigh). If you work in a large company, you’re probably familiar with indirect or overhead costs. For example, if you’re in sales you can easily show the revenues and expenses for your department, but what if you’re in accounting, which is an essential function but doesn’t generate any revenue? Unless you decide to close the accounting department, you have to cover those expenses. That can be simply recorded as an expense but if you’re trying to more accurately understand your finances, you allocate the cost of those services to various users, hence an overhead or indirect expense. The big question is, what do you charge? Is it an hourly billable rate, a flat rate on revenues, or something else? And it become increasingly complex as you consider the cost of utilities, equipment, and buildings, and some departments use administrative services more or less than others. To figure this out, the City of Rockville hired MGT of America to conduct the research and they calculated an indirect rate of 13.19% (CAP, page A-11). Is that too much or too little? If it’s too low, the City won’t cover its expenses and will either have to cut services or increase revenues (if it was a business, it’d go bankrupt). If it’s too high, you’d generate a surplus for the “back office” but you’re also withholding funds that the “front office” needs to do its job. One way to see if an overhead rate is unreasonable is a comparison with other businesses. According to SageWorks, overhead at retail stores in 2013 in the US averaged 22%, professional services (such as lawyers or accountants) had 51%, and new home builders were 20%. More helpful would be a comparison of rates for comparable cities in Maryland but so far, that hasn’t been easy to find. Of the four incorporated cities that are similar in size to Rockville, it does not seem that cities of Bowie, Frederick, or Gaithersburg allocate indirect expenses. Anyone really good at math?